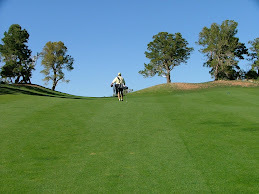 A review/evaluation was recently posted by Kiel Christianson on travelgolf.com of the new Sizemore putter. It’s of the mallet variety and, according to Christianson, this will make you sink putts like it’s your last round. The price for this “miracle” putter - $219. I guess for $200+ the magic must stay with this putter for a longer period of time than it would for, say, a $175 putter. To the Sizemore Company we must thank them for their contribution to the ever-increasing price of golf. To Mr. Christianson, wait until you have missed a three-footer to seal the deal on a $5 nassau, then we’ll get another assessment.